RIO DE JANEIRO, BRAZIL – Nine state capital cities in Brazil have now elected their mayors in the first round of Brazil’s nationwide municipal elections. For the rest, where candidates failed to reach the fifty percent threshold for an outright win, the two top candidates now go forward to a second round of voting, held on October 28th. São Paulo will head back to the polls on October 28th to pick either Fernando Haddad (PT, left) or José serra (PSDB), photos by Henrique Boney and Cacalos Garrastazu/Wikimedia Creative Commons License. Among those voted in without the need for a run-off was incumbent Rio mayor Eduardo Paes, who got 64.6 percent of the vote. However, all eyes are now on São Paulo, after front-runner Celso Russomanno surprisingly fell out of the race, despite leading opinion polls in the weeks ahead of the first round of voting. 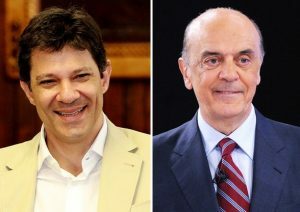 Left in the wake is a second round to be fought between José Serra (PSDB), former São Paulo mayor and governor who left the latter position to run against Dilma Rousseff in the 2010 presidential elections, and Fernando Haddad (PT), who left his role as Minister for Education to run for mayor. Serra secured 30.75 percent of the vote in the first round, while Haddad managed 28.98 percent, according to the electoral commission. Over 8.6 million people are eligible to vote in the city. President Rousseff’s ruling Workers’ Party (PT), of which Haddad is a member, saw its share of “mayoralties” in the country rise by twelve percent, from 558 to 627, surprising some who believed the ongoing mensalão scandal had the potential to derail many PT-affiliated candidacies. Haddad himself has been tainted by the cash-for-votes scandal, but it appears not to have affected the vote as much as predicted. 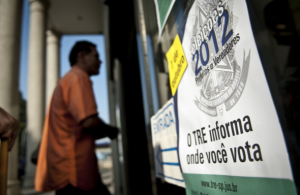 A voter arrived on Sunday (October 7th) in the first round of the 2012 elections, photo by Marcelo Camargo/ABr. Serra says he is the most experienced candidate, one with a “make it happen” attitude, and vowed to improve the healthcare system. Haddad said São Paulo was worried about its future: “You either get behind what you have now, or you get behind change. That’s what’s at stake,” he said, vowing to improve transport in the city. The fight is now far tighter but also more clear-cut, say analysts, and will probably have voters split down party lines. The candidates are in for a major political clash – one set on the national stage. Although Serra shows some concern for social policies, his interest lies in the economy, which he believes the state should keep out of as much as possible, and have more of a regulatory role, our commentator adds. “Haddad is a relative outsider within his party (PT), despite being affiliated with them since 1983. He’s an intellectual, an academic; he shows minimal participation in party politics and therefore is difficult to judge, but he appears to be aligned with the party’s policies in terms of social policies,” Professor Braga concludes. As the fight is to win local votes, the campaign has not yet touched on how the candidates would prioritize foreign business, but whoever wins the title of São Paulo mayor in the second round, due to be held on October 28th, that person will be in charge of Brazil’s biggest city and business powerhouse, which is home to over 11 million people.